The first step in arc welding is to learn to set up your equipment properly. Understanding all of your equipment and the function of each component helps to ensure your safety and also allows you to produce a better product. Check all cables for damage and replace if necessary before starting any new welding project. Nicks or frays in the welding leads may pose an electrical hazard. Plug your power source, which refers to the type of welder you are using, into the appropriate electrical outlet. The arc welding power source provides either an alternating current (AC) or a direct current (DC) using either a positive or negative electrode. The type of job is the determining factor when you choose current and polarity. Connect the electrode lead from the welder to the insulated electrode holder. Place the proper electrode in the electrode clamp. The electrical arc forms between the base metal and the electrode as you guide it along the weld joint. Complete the circuit by running the work lead from the welder to the base metal. To do this, attach the ground clamp to the piece of metal you're working on, as close to the weld as possible. Always wear the proper safety gear when welding. This includes leather gloves and apron, appropriate welding helmet and rubber soled shoes. Keep your welding equipment dry and avoid welding in a wet environment. 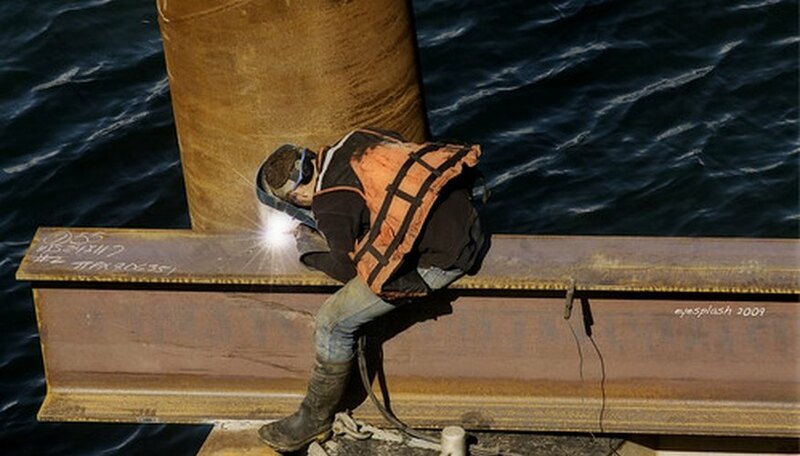 Protect the people around you when you're welding. Anyone within 20 feet should also wear protective gear.